Select finish options make this Vaxcel Chatham T014 Outdoor Ceiling Light a good match to your home design. 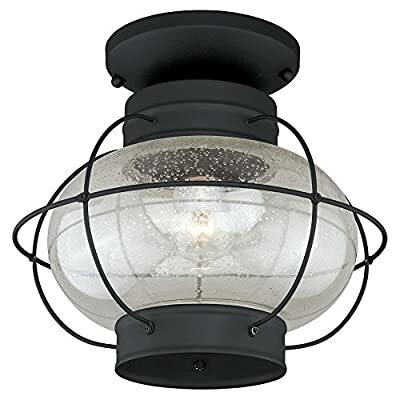 This outdoor ceiling light boasts a round lantern shape and premium seeded glass globe shade. It requires one 100-watt bulb, not included. About Vaxcel LightingFor over 20 years, Vaxcel International has been a premier supplier of residential lighting products. Based in Carol Steam, Ill., Vaxcel's product line is composed of more than 2,000 items, ranging from builder-ready fixtures and ceiling fans to designer chandeliers and lamps, in the latest styles and finishes. They're known in the industry for offering a full selection of products at competitive prices. Dimensions: 13W x 13D x 12H in.. Choose from available finishes. Round clear seeded glass shade. Requires one 100-watt incandescent bulb (not included).